In the industrial elevator and construction machinery industry, the name GEDA represents competence, consistency, and value. 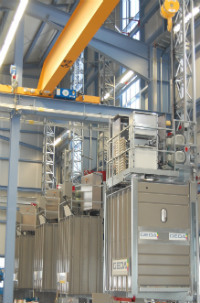 GEDA’s rich history began over eight decades ago in Germany, where the company earned a reputation for developing innovative, superior-quality vertical transportation equipment. Since opening its German doors in 1929, our company has extended its international reach to include six continents. Today, GEDA is a recognized industry leader, and we’re proud to have manufactured and installed thousands of hoists and rack & pinion elevators worldwide. At GEDA USA Elevator and Material Lift Company,our diverse product range includes four major areas: temporary installations, permanent installations, special products and industrial elevator service. No matter what your application requirement, it’s addressed by our experienced team of management professionals, engineers, technicians and quality control specialists. Each is an expert in their field, and is 100-percent dedicated to client satisfaction. From small rope hoists to personnel hoists and permanent industrial elevators,GEDA USA provides everything you need for the safe, efficient transport of people and material. All GEDA rack and pinion lifts and hoists are manufactured to comply with industry standards, and can be certified to meet ANSI A17.1 and EN-81. GEDA is certified to DIN EN ISO9001:2015 Quality Management system standards, and ISO 14001:2015 Environmental Management system standards. GEDA is also a proud member of the German Mechanical Engineering Industry Association (VDMA). At GEDA USA, our first commitment is to quality, safety, and customer service, and we are confident that we will meet your expectations. Contact our team today to place an order, inquire about pricing or request elevator specifications. Challenge us with your next project, and discover why GEDA has been the choice of engineers, contractors, and owners the world over. Thanks for visiting GEDA USA. We look forward to collaborating with you!